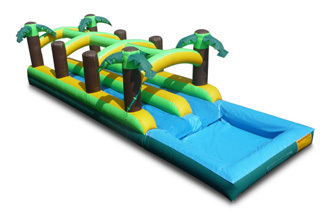 This inflatable not only has one lane but two lanes of wet slip-n-slide action. What does that mean?! This means lines are shorter and twice the amount of use per hour. Who needs a swimming pool when you have a cool pool to land in after you glide on water?! This is one of the biggest Waterslides in the Houston Area!! 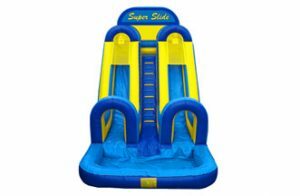 The Blue Crush is 27 ft High & 65 ft. long with dual lanes & a pool at the end! 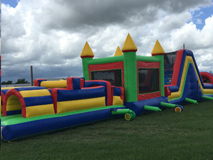 This is sure to get the adrenaline rushing and is great for any event! 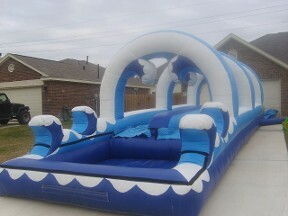 This unit is 22 ft. high and 60 ft. long with dual lanes and rocky arches all the way to the pool. Great for all schools, churches, and companies. The Roaring River is sure to impress! Your own backyard Splash Island. 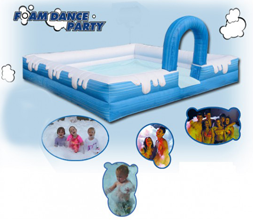 Our Inflatable Splash Island is constructed for years of fun. Watch their eyes light up as they climb, slide, splash and shoot hoops! 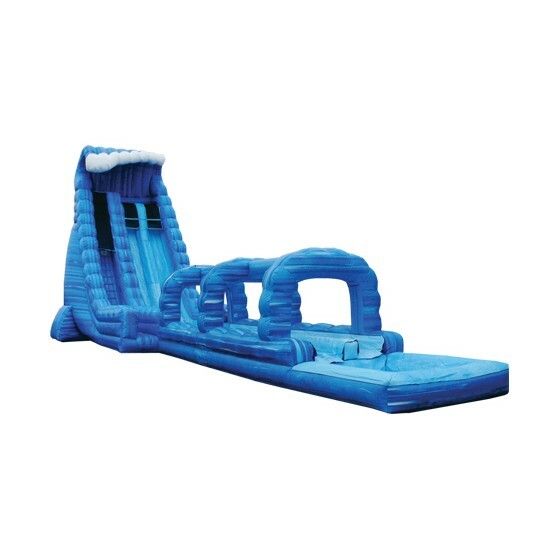 Simply hook up to your soaker hose and you've created a cascade of water that makes this slide double fun! The Super Slide is 20 ft high, dual lane, and has a pool at the bottom. Race each other down this amazing steep slide! 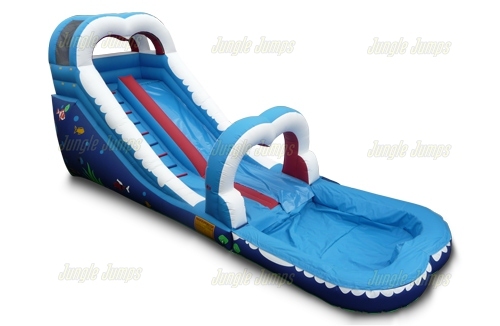 The 18 ft. Waterslide has a double drop down the slide to make that much more fun! It has a detachable pool and fish art work on the side! The Colossal Combo It's the ultimate water unit, with a dual lane start, pop up obstacles, a full size jumper with a basket ball goal, race to the top of the slide on dual ladders, slide down the slide past the slip'n'slide attachment into the pool. 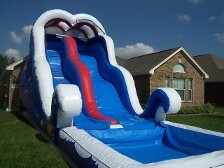 YES, It's 78 feet of pure fun!. Foam Pit Party This is sure to be a hit at your next event! Foam! Foam! Foam! which is safe and fun! The Super E Foam machines can fill up our pit in under 3 minutes! The foam comes with no odor and is 100% organic. Yes, it’s hypoallergenic. It stains as much as regular water stains. 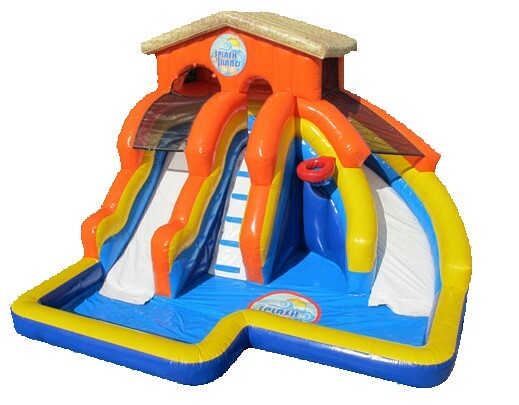 It’s as slippery as regular water is and comes with a huge 20 x 20 foam pit!!. 18 ft. Tropical Waterslide!! 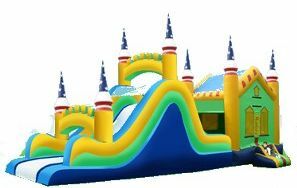 Double drop slide and a detachable pool, great tropical fun for church events, company picnics, or backyard themed parties!!! 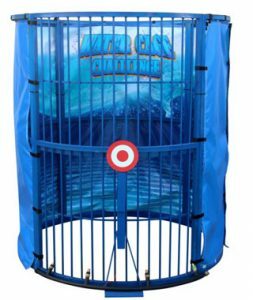 The Water Cage Challenge is a safe and convenient alternative to outdated Dunk Tanks. There's no tank to fill, no risk of drowning, and the throughput is much higher because contestants don't need to climb up onto a pedestal repeatedly. 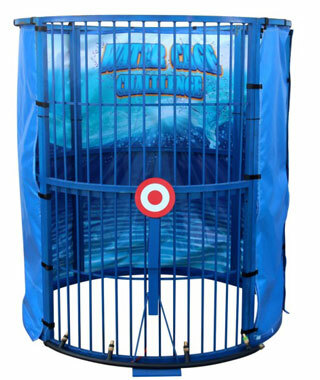 Hit the target to blast the unlucky contestant in the cage cool water from several spray nozzles. 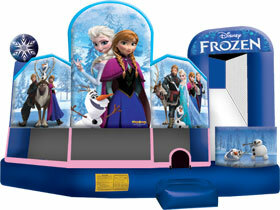 Disney's Frozen 3D 5-in-1 Combo (Wet)Enjoy your event with Elsa, Anna, Kristoff, Hans, and Olaf of course! 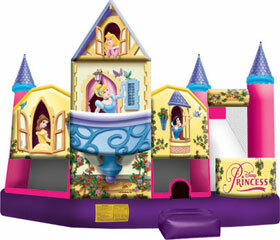 There's a bouncer, basketball goal, log and pop up obstacles, and slide. .
5 in 1 3D Disney Princess (Wet)! This unit can be used wet for your princess, with a basketball goal and obstacles that will bring fun to the party! 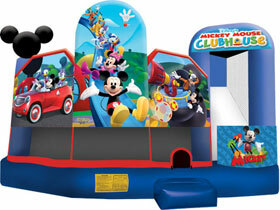 Kids of all ages will enjoy the Mickey Mouse Unit! There's a bouncer, basketball goal, log and pop up obstacles, and slide. Great for hot summer days!. 16 ft. Waterslide!! 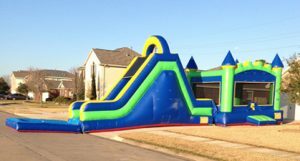 Great for those hot summer days, 16 feet of fun. Decorative fish on the side and a pool at the end! Use both lanes to race and see who can reach the pool first! Great fun!!! 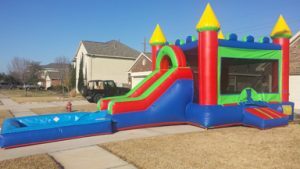 The ultimate combo, a full size jumper, basketball goal, ladder and slide, it's great fun with plenty of space for all ages and over 45 ft. long with a pool at the end! The colorful new combo, a full size jumper, basketball goal, dual ladder and slide. 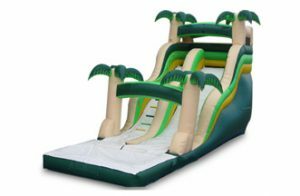 Bounce, race to the top and enjoy the steep slide down into the pool! 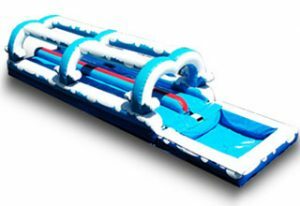 The Tropical Slip'n'Slide has two lanes for twice the fun! 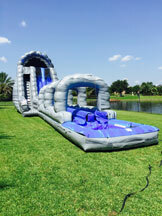 Cool off from the tropical heat, great for themed events!. The Kid Combo Wet is great safe fun for those smaller children, a full size jumper, basketball goal, ladder... slide in to the pool to cool off!.